The wonderful personal messages that one chances upon inscribed on headstones in Commonwealth War Graves Commission (CWGC) cemeteries never fail to touch the heart. Every visit throws up a number that stay in the mind. It is perhaps appropriate that they are not yet all available on a database but only to the visitor to the cemetery as a sort of personal and intimate whisper from the past. The regulations governing the personal inscriptions were sent out by the then Imperial War Graves Commission (IWGC) on Final Verification Forms sent to every relative immediately after the end of the Great War. These forms not only verified certain information for publishing IWGC registers but also allowed the next of kin to supply their chosen inscription. 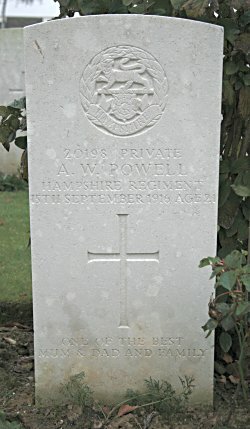 Here are published a selection of personal inscriptions found on CWGC headstones of the Hampshire Regiment across the Western Front. 6599 Corporal George Mills M.M. Redan Ridge Cemetery No 2. ONE OF THE BEST THAT GOD SHOULD LEND. R.I.P. A LOVING HUSBAND LIETH HERE. R.I.P. 33369 Serjeant Sydney Frederick Hawke M.M. 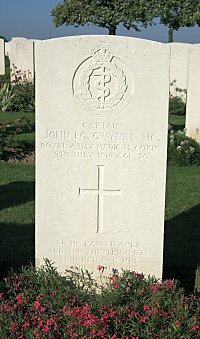 Captain John F.G. "Doc" Gwynne M.C. About 5.15 a.m. our splendid 'Doc' (Capt J. F. GWYNNE R.A.M.C.) went up to the trench to see what he could do. He spent a long time tending to the wounded left by the LANCS FUS and then bandaged up a Rifle Brigade bomber who has just blown his hand off. No sooner had he finished and straightened himself than a sniper shot him through the head, killing him instantly, and we lost one of the finest and bravest members of the Battn. He was buried in the evening in the brigade cemetery just behind TALANA FARM (S. of BOESINGHE).